Withings and L'Oreal teamed up to make the Kérastase Hair Coach. L'Oreal has been gently getting into the technology game, first by partnering with Dr. John Rogers on a skin-damage-tracking tattoo. 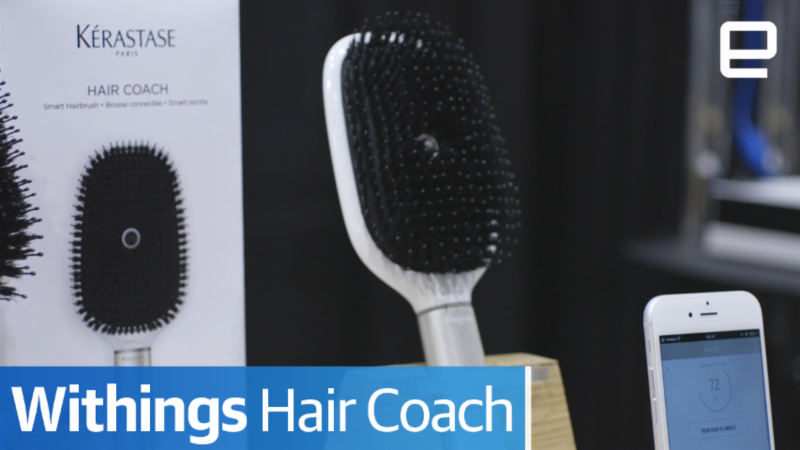 Now the cosmetics giant has hooked up with Withings to develop a smart hairbrush that's designed to keep your scalp at its best. The Kérastase Hair Coach, as it's called, was apparently inspired by people's propensity to brush their hair too forcefully, causing long-term damage. In order to combat this, Withings used its engineering know-how to cram the brush with tech. That includes a microphone that can listen to the sound of your hair to offer insights on frizziness. In addition, a gyroscope is capable of analyzing your brushing patterns to measure the force that you apply when unknotting your mane. Should you pull too hard, the handle will vibrate in order to warn you to go easy on your scalp. Finally, a conductivity sensor helps determine if your hair is wet or dry (in case you weren't sure yourself). All of this data is pushed to a smartphone app that crunches it alongside the local weather information to give you tips on how to best care for your hair. As you might expect, you'll also get recommendations for other L'Oreal's Kérastase-branded products you should buy in order to ensure that your mop remains lustrous. It's unclear how much the brush will cost, but it's expected to retail for less than $200 and will begin shipping partway through the year, according to the two companies. Much like the smart toothbrushes of this world, it's not as if anyone needs a smart hairbrush if they have a modicum of sense. There are, after all, plenty of websites that offer tutorials on how best to look after your scalp and people you can speak to at your local salon. But as one L'Oreal representative said, this device isn't as much about providing new information as collecting it in one place for time-poor millennials. The cosmetics company also isn't expecting the device to be a best-seller but more of a statement of its future intentions of developing more beauty hardware. So be warned. Nick Summers contributed to this report.